We realize that most people could care less about what model of press or digital printing machine we use, so long as they receive what they ordered. Still, we can't help being proud of our toys. Once you see how great they make you look, we hope you'll be proud of them, too. As an Adobe Influencer Member, we'll always have the very latest Adobe software. 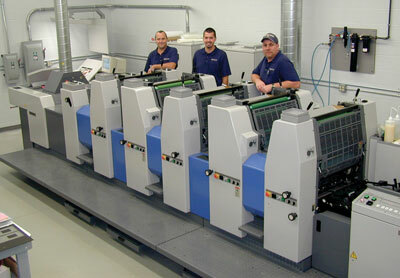 We can inkjet addresses on printed materials at high speeds. Our fast drying ink and Infrared Curing equipment can print directly on aqueous coated sheets. This machine applies multiple wafer seals in-line also. Our inserter can insert up to 5 pieces into an envelope, then seal it automatically. This allows us to get your mailings out quickly and accurately.